What our elected officials will confess to is a debt of $8 trillion and some change. That is commonly called Total America Debt and is defined as the sum of all recognized debt of federal, state & local governments, international, private households, business and domestic financial sectors, including federal debt to trust funds. 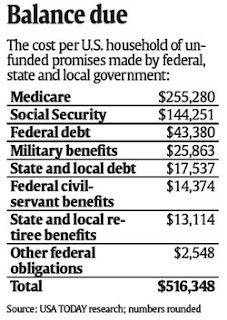 But it excludes the un-funded liabilities such as social security, government pensions and Medicare. If you included the liabilities (or the ones we can foresee) total debt in America becomes $48 trillion. See the image above for a breakdown of un-funded liabilities and their cost per household. And if you want to lose even more sleep, realize that nobody is predicting the long term cost of our wounded troops (34,650 as if 05/19/07) returning from Iraq. There may be medical bills for each of them for years or decades to come. And nobody has begun to even estimate the size of the bill for that. The Republicans do not want to tell you the true depth of our debt because they know it will add even more fuel to the fire and accelerate the downward spiral of Bush's popularity numbers. And god-forbid somebody wake up and realize we've spent $438B (BILLION!) in Iraq. The Democrats do not want to tell you the true depth of our debt cause they know the first items that will be cut in order to (shudder) balance the budget will be social programs and minority spending. Both of which will have negative results on their popularity. So we are spoon fed lies by both sides. Our elected officials are sitting in office spending and spending and spending as quickly as they possibly can, knowing the burden of the debt doesn't fall on THEIR shoulders. It will be our burden to bear. And our children. And our grand children. It is easy to spend somebody else's money. But who bears the budren of that debt?